NICK Kyrgios has been forced to pull out of Wimbledon due to injury after less than an hour on the court. The Australian withdrew after two sets in his first-round match with Pierre-Hugues Herbet, trailing 3-6 4-6. He praised his opponent after the match and said he "knew he was in trouble" from the outset. "I've been feeling my hip ever since I fell over at Queens and I never really got it right," he said. "I was doing everything I could to help it but obviously just not enough time. I just wasn't 100 per cent. Nothing to take away from him, he plays great grass court tennis." Kyrgios conceded pre-tournament he was only "60, 65 per cent" fit after aggravating the longstanding injury during an on-court fall at the Queen's Club lead-up event a fortnight ago. The writing was on the wall from the moment he stepped on to court on Monday, his forlorn body language and restricted movement depicting a player not equipped to go the distance. Kyrgios called for the trainer at the completion of the second set and announced he could not complete the match just minutes later. The Australian struggled throughout the first-round match with his hip injury, bravely playing on, but proving no match for the Frenchman. Tennis legend John Newcombe said the injury was clearly limiting Kyrgios and that he was surprised the Australian continued for two sets, given the amount of pain he was clearly in. "Really disappointing for the young guy," Newcombe told Seven. "You can see how concerned he was right through that, I thought he should have stopped a lot earlier if it's that bad. "When the trainer got out there and tried to move his left leg, put pressure on the hip in a certain way - it just wouldn't go. It's obviously a serious problem, he needs to address that." Newcombe has advised Kyrgios to take an extended break from the game, to help properly deal with the injury. 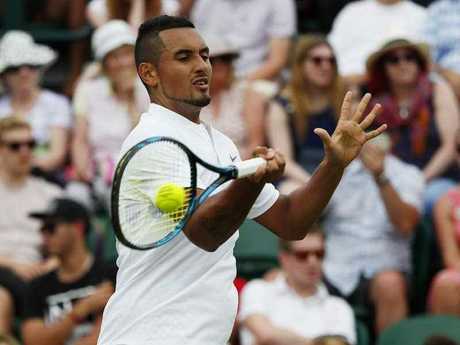 The problem has already impacted his French Open preparation and Kyrgios has now seen the same issue bring down his promising Wimbledon hopes. "Let's just hope it's not too bad a structural problem, which could require an operation," Newcombe said. "He really needs to get it looked at and find out exactly what the issue is and if it is a serious issue, just take time off and get it right." Newcombe admitted that Kyrgios is not physically ready to compete consistently with the best in the sport. He has urged Kyrgios to dedicate himself more to the sport, to ensure he is well prepared physically, and able to fufill his enormous potential on the court. Newcombe said the young Aussie still has time to transform his game and his body, but he must show more. "Maybe this is a warning sign for Nick," Newcombe said. "There's been a number of niggling injuries over the years and I don't know exactly and I have heard reports that he's not as fit as he should be. "That just takes discipline. You can find people to get yourself really fit, I think Nick needs to do it." A Wimbledon quarter-finalist on debut in 2014, the world No. 20s exit will also precipitate a further rankings fall after he had soared to a career-high 13th late last year and then opened 2017 with a blazing run on US hard courts. Kyrgios laboured through the opening set, dropping serve in the eighth game with his second double-fault before the Frenchman took it after only 26 minutes with an easy love hold. Australia's 20th seed continued to play hit-and-miss tennis in the second set and didn't even bother attempting to reach some of Herbert's winners. He dropped serve for a second time when, facing break point, he was unable to move forward to retrieve a short return from the world No. 70. He hung his head in his towel at the changeover, then wiped away tears as he returned to the court. The next changeover, when clearly resigned to his fate, Kyrgios whacked his racquet against the net post before again wallowing in his chair. The crestfallen Canberran called for treatment after going two sets down before finally conceding defeat.